More than 100 students and educators gathered at the Bayou Terrebonne Waterlife Museum in Houma, LA for activities hosted by the South Louisiana Wetlands Discovery Center. Coastal Wetlands Planning, Protection, and Restoration Act staff were in attendance to talk with students about the different types of wetlands we have in Louisiana. In addition to a scavenger hunt in the museum as they learned about the services that wetlands provide, students had the opportunity to get up close to wetland wildlife, learn about different wetland habitats, and think about how water moves through coastal and urban systems. 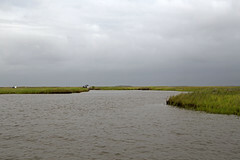 Groups providing activities included Restore or Retreat, the Barataria-Terrebonne National Estuary Program, LSU Wildlife Hospital of LA, and the USDA Sugarcane Research Station. In addition to wildlife habitat, wetlands provide flood control, water purification, and sediment capture services, making them important for urban and rural communities. World Wetlands Day is designated as a day to raise global awareness about the value and benefits of wetlands for both humanity and the planet; it is celebrated every February 2nd. Wetlands provide an immense number of benefits to not only the surrounding areas via protection, but also thriving aquaculture industries and commodities on both a national and international level. Healthy wetlands play a vital role in sustaining life and acting as natural safeguards in extreme weather events through disaster risk reduction. The Coastal Wetlands Planning, Protection, and Restoration Act participated in the appreciation of wetlands by attending the World Wetlands Day Celebration on February 2nd, 2017 at the Bayou Terrebonne Waterlife Museum in Houma, La. The South Louisiana Wetlands Discovery Center hosted its 8th annual celebration by inviting third grade students from St. Matthews Episcopal School and Honduras Elementary, as well as sixth grade students from St. Francis de Sales Catholic School, totaling 185 local students, to learn about different aspects of wetlands. The CWPPRA Public Outreach Staff informed students about the relevance of wetlands by drawing connections between four different yet familiar types of wetlands and seafood, previous hurricane activity in the region, industry jobs, and wetland functionality. In order to do so, the CWPPRA staff incorporated the Where the Wild Things Are game to teach the students about wetland habitats and the animals living in them. This game consisted of students matching different wetland bean bag animals to the correct habitat: swamp, marsh, barrier island, and ocean. Where the Wild Things Are provides an opportunity for students to understand the connections between different wetland environments, recognize the adaptability of some animals to more than one habitat, and identify specific characteristics of each habitat, such as vegetation. On Tuesday, February 2, The Coastal Wetlands Planning, Protection, and Restoration Act’s Public Outreach staff attended the 2016 World Wetland’s Day Celebration at the South Louisiana Wetlands Discovery Center in Houma. In attendance were nearly 200 local students from St. Matthew’s Episcopal School, St. Francis de Sales Catholic School, Honduras Elementary, and the Home School Association. The CWPPRA Outreach staff exhibited two interactive games entitledWhere the Wild Things Are and Wetland Animal Tracks, where students were able to learn about wetland habitats and the animals living in them. Where the Wild Things Are consists of each student receiving a number of different wetland bean bag animals which must be tossed to its correct habitat: swamp, marsh, barrier island, and ocean. Similarly, the Wetland Animal Tracks game displays a photo of the tracks of different wetland animals, prompting students to guess what animal the tracks belong to based on photos and natural history clues. The CWPPRA staff also handed out wetland hero coloring sheets, as well as brochures which highlight CWPPRA’s efforts to restore Louisiana’s wetlands.